The Star Struck shirt has a shinny liquid lame' base with holographic material overlays and appliqued stars. 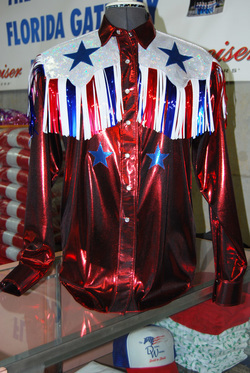 Alternating red, white and blue mylar fringe adorns the front and back yokes of this beautiful shirt. There are three stars on the back overlay. Western collars, cuffs and pearl snap closures. As with all our shirts, you may change the color combinations and materials to suite your needs!